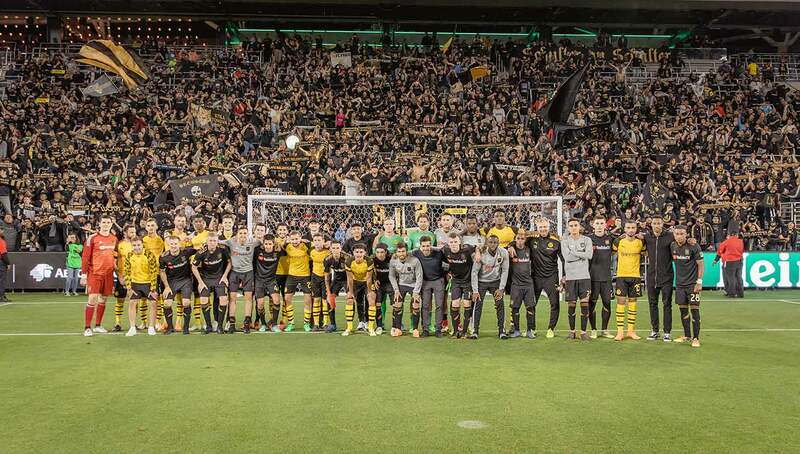 Despite being located thousands of miles apart, LAFC and Borussia Dortmund share a deep connection, starting with each club’s supporters’ group. As you could imagine, an outpour of passion occurred when the two teams met in a friendly match earlier this week. We were on the scene to capture the raw and uncut voices of the fans in attendance for the latest edition of Heard on the Street. 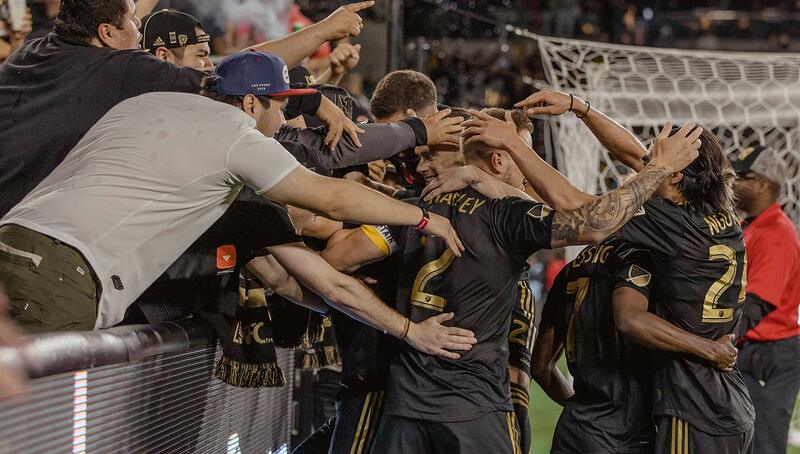 At every home game, LAFC’s support group, the 3252, holds up a banner that reads “shoulder to shoulder,” an ethos stitched into the foundation of the team’s character (and their jerseys). 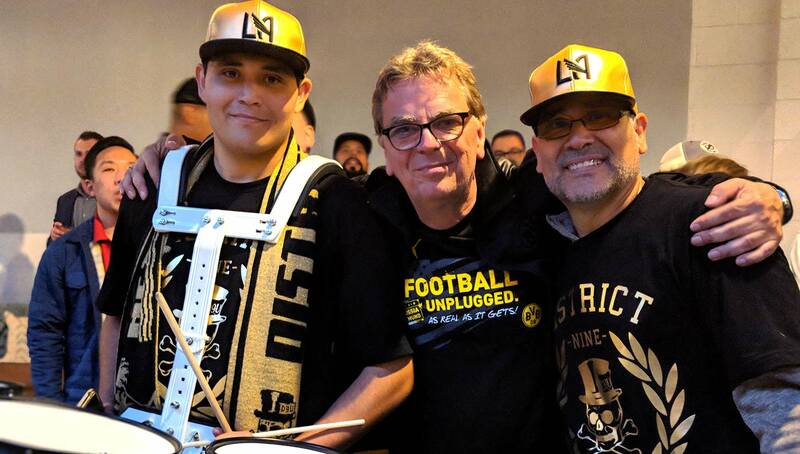 However, during LAFC’s friendly match against Borussia Dortmund (BVB), Los Angeles soccer fans spread their reach a little further to stand shoulder to shoulder, or rather “schulter an schulter,” with the German team and its fans. Tuesday’s friendly game was LAFC’s first match against an international team, and just their fifth home match, but the Los Angeles club has long since been intertwined with BVB, as reflected by Banc of California Stadium’s North End Supporters Section, crafted to mirror BVB’s 25,000-strong Yellow Wall, known as perhaps the most ravenous supporters’ section in the football world. The game itself was nearly evenly matched. 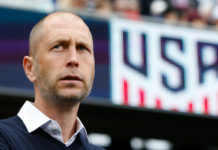 Both teams pulled from their bench early on, though fans did get to see team favorites including Laurent Ciman (LAFC) and Christian Pulisic (BVB). 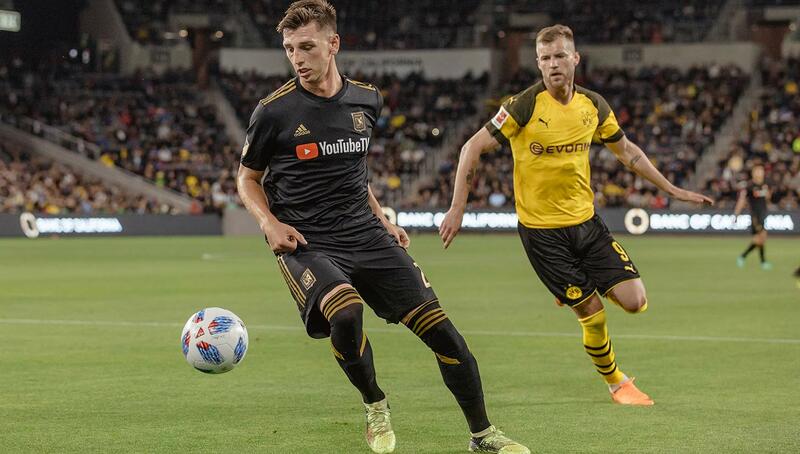 After a goal in the second half from LAFC and a late goal from BVB, the game ended in a 1-1 tie. While the match itself was rather ordinary, it was the fans’ reaction to each other that made it stand out. 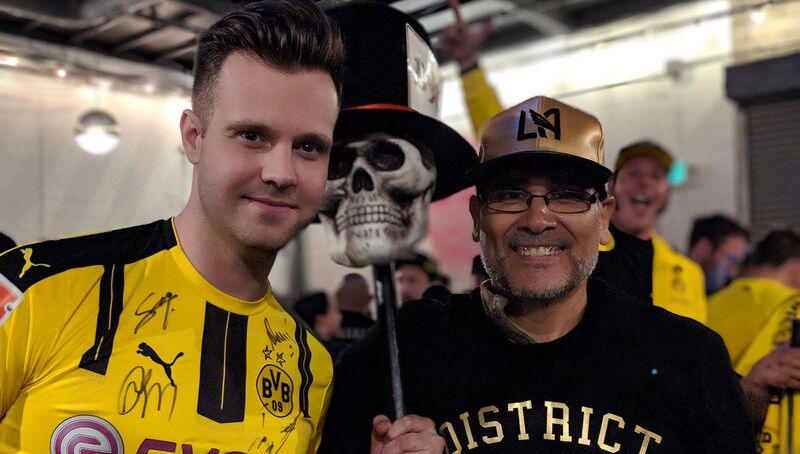 Inside the stadium, both supporters could be heard loud and clear, and many had both LAFC and BVB gear on to show support not only for their teams, but for the beautiful game itself. The mix of black, gold, and yellow gear in the stands made for a colorful fan atmosphere, and regardless of who they were rooting for, supporters shared a sense of camaraderie. 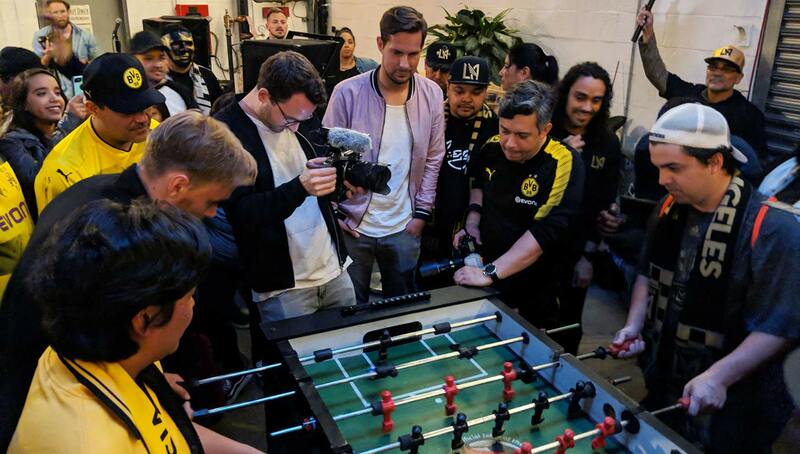 The night before the friendly match, fans congregated at Boomtown Brewery to receive BVB in a Welcome Rally event that included player appearances from both teams, autographs and raffles. Throughout the event, each supporters’ group took turns cheering on their team and even swapping chants amongst each other. While BVB and LAFC’s partnership is not uncommon — many teams take up international ties with each other — Monday night’s Welcome Rally and Tuesday night’s game displayed a unity of fans that highlights why their international bond so unique. Many were avid fans of both teams, a product of the clubs’ supporters-first soccer culture, and in the end it was more about celebrating the game than choosing a team. 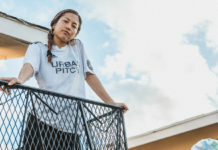 Urban Pitch was on the scene at both the Welcome Rally and friendly match, capturing the voices of LAFC and BVB supporters’ alike on the unique atmosphere and love for football displayed at both events. What brings you out to tonight’s welcome rally? Marion Feller: I’m part of the Los Angeles BVB fan club and also an LAFC season ticket holder, so this is a big event. I knew from (the fan club) we were having this event. I’m originally born and raised in Dortmund where BVB is from, so this is a once-in-a-lifetime event. Kyle Thayer: I’ve been a big Borussia Dortmund fan since 2010. I had a best friend who was a foreign exchange student. I went to visit him and his family in his hometown and Dortmund was their team. They were coming up as one of the best teams on the Bundesliga, and I just fell in love with the team while I was over there. I’m very stoked that they’ve come to the United States and that we have the opportunity to come out and see them. The players were so great. They were really engaged with the fans. It’s so cool. Luis Ramos: I’m out here to support LAFC. I heard a couple of our members went out to Borussia out in February. I heard it went great, so we wanted to be out here to return the favor and receive Borussia in LA. How does this stack up against all of the other LAFC events? If this is your first, what’s your first impression like? Marion: We’ve been to all the LAFC home games, and we went to the first meeting between LAFC and Dortmund. The events are great, especially this one. We are friendly and supporting each other. The sport needs more recognition to get the word out. Kyle: This is my first LAFC event, but I’m from San Diego, and I’ve been very closely following LAFC. I’m really happy to have such an awesome team here in Southern California, you know a little opposition to the Galaxy. I prefer to support the underdog, and LAFC is an up-and-comer. It’s going to be a fun couple of years. Tonight’s event has been great. The league and players have been very open. We’ve had a great time interacting with the players. Luis: I was fortunate enough to be at the signing of Carlos Vela, and I’ve been to all the home games. I think these events are a great opportunity to get involved with the team. So far, it’s been worth it to come out. 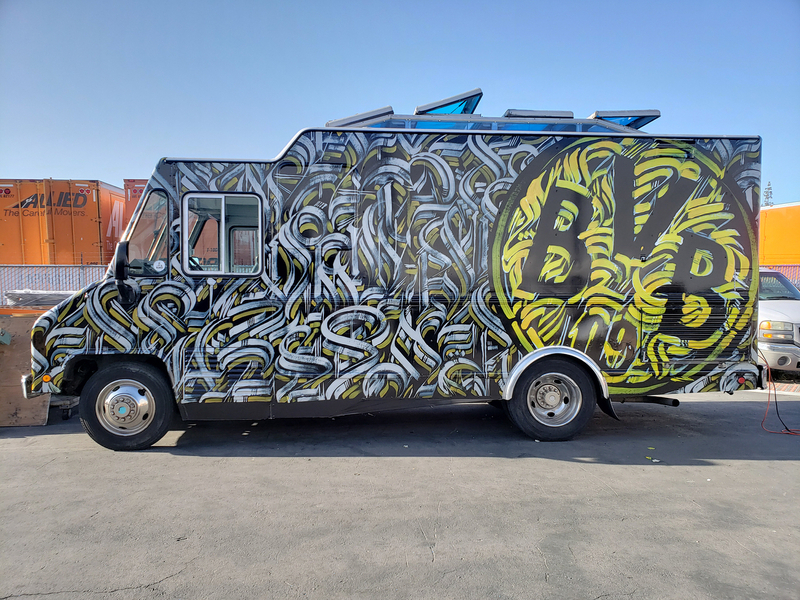 BVB has its own food truck in L.A. that will be parked outside the stadium tomorrow. Items on the menu include currywurst burritos, schnitzel sandwich, and curry cheese fries. If LAFC had its own food truck, what would be on the menu? Marion: Oh, that would be great. They’d definitely have tacos, definitely burritos and maybe some sort of steak dish! Kyle: Since they have a partnership with Dortmund, I think it’d be fun to bring over some of that region’s food. Some of the kabob style, kabob sandwiches, things like that on the menu would be fun. Curry fries are awesome, and schnitzel always has its place at a soccer game. Any of those items would be really great. Luis: I mean, it’s LA, so tacos! It’s been an even match so far, how do you think each team would fare if they switched leagues — LAFC to the Bundesliga and BVB to the MLS? Mia Giddens: (BVB) would do better in the MLS than LAFC in (the Bundesliga), just because European soccer is more competitive and brutal. Gabriel Corral: BVB would rock MLS, not so much for LAFC in the German league! Max Hollander: They’d be the best team, and LAFC would probably be the worst team. Do you think friendly matches are as exciting as league games? Mia: Yeah, they’re fun. It’s about unity and you get to see a little bit of everyone on the field. It’s just fun. Gabriel: Not always, but it’s one of the few chances we get to see European teams, so I’m going to make it out every time. Max: I think they’re better because it gives you a chance to see a team that you would not normally see. Americans think of European soccer as the best soccer in the world. So it’s great to be able to see that. LAFC’s supporters’ section was inspired in part by BVB’s Yellow Wall. How do you think LAFC’s 3252 support group will hold up against their German counterpart? 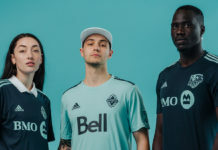 Mia: LAFC’s is actually pretty good. We stand in the LAFC supporters’ section and everyone is standing the whole game. The people around you exude positive energy, and a lot of us have been born and raised in LA. We’re here for our team. Gabriel: So far, we’ve matched the Yellow Wall in spirit. We’ve been loud and proud, so I love it. Max: Not nearly as awesome as their supporters section. They obviously have more people in their support groups. Who do you got: Carlos Vela or Christian Pulisic? Mia: That’s tough, but it has to be Vela all the way. Gabriel: Right now Vela because he has more experience. In the future though, I think Pulisic is going to be the better player. Max: Pulisic. I mean, he’s American. I’m American. A lot of people think he is the future for American soccer. 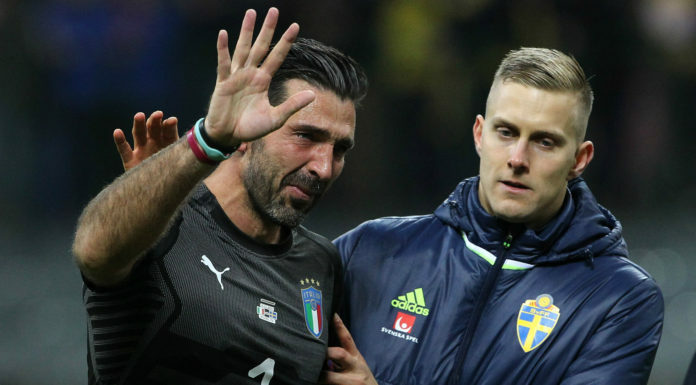 I think it’d be awesome if he came back to play in MLS, but it’s really great to see him make a name for himself in European soccer, which usually doesn’t happen. 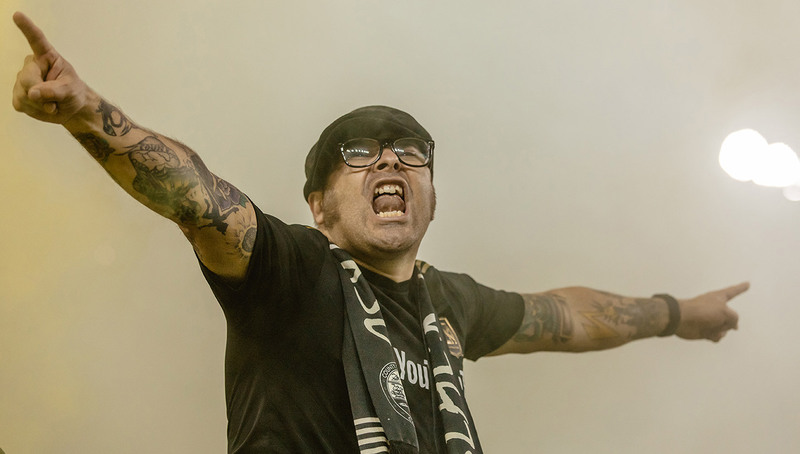 Match photos by Imad Bolotok for LAFC. Welcome Rally photos by Patricia Sanchez.